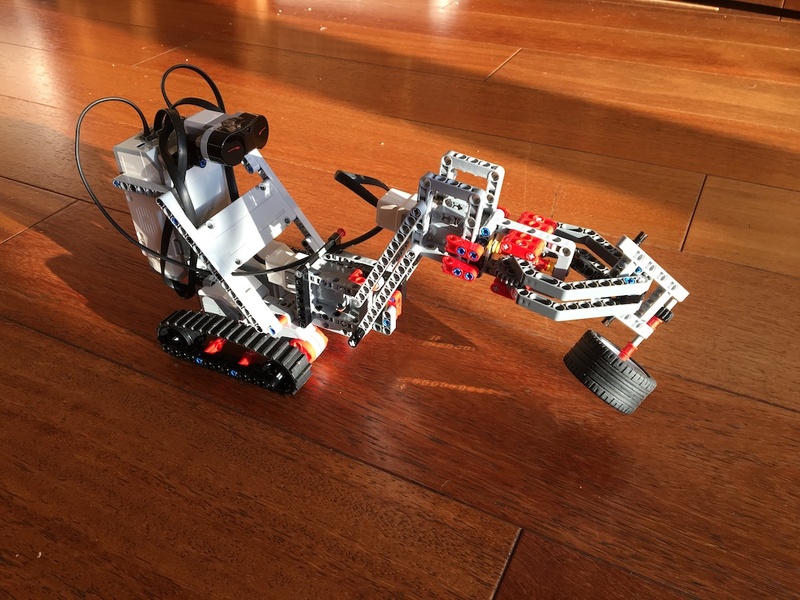 Read on for a list of 10 ways to get the most out of your Mindstorms kit! 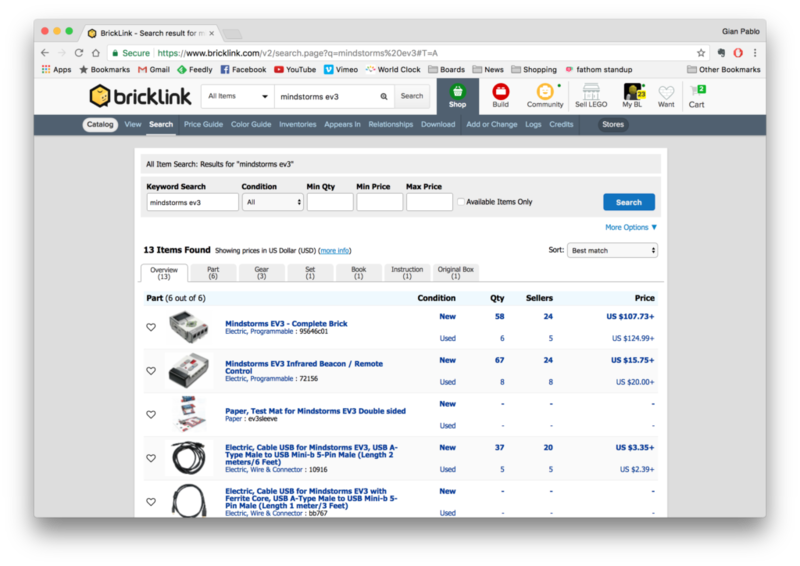 Bricklink is like an eBay but only for Legos. It is full of individual sellers that stock pretty much every Lego part, at very reasonable prices. One of the most useful features is the Wishlist: you can build multiple lists of parts that you want, and then with a push of a button the system will search all sellers, and put together orders that will get you the parts you need at the lowest price and the smallest number of sellers. Mindstorms parts are Lego parts, so as you expand your set, this is a good place to go. The Lego documentation that comes with Mindstorms is enough to get you started, but isincomplete. You should definitely invest in a couple of good books. 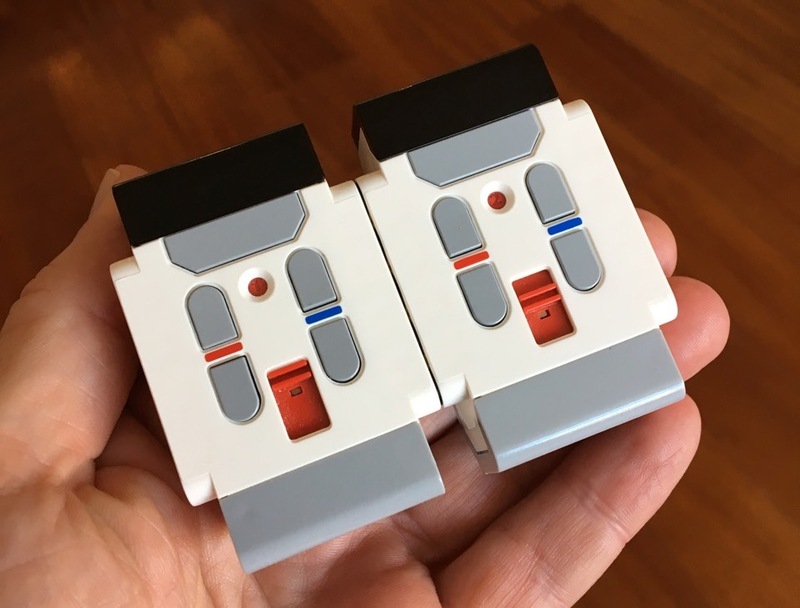 I found “The Lego Mindstorms EV3 Laboratory” pretty good (in spite of the black and white illustrations), it covers very useful design patterns for Lego, and has some useful lists of expansion parts. Also “The Lego Mindstorms EV3 Discovery Book” covers some of the same ground but with color illustrations. The Lego Mindstorms EV3 “brain” has 4 sensor inputs and 4 motor outputs. However, the kit ships with only 3 motors: 2 “large” motors suitable for drive wheels, and 1 “medium” motor suitable for an effector. As a result, most books and online instructions jump through all sorts of hoops to achieve complex results. So go ahead and buy 1 more motor, I would recommend the medium one. This way you can build a motorized robot with an arm that goes up and down, and a claw that opens and closes (for example). The Mindstorms EV3 IR (infrared) control is interesting. It can be used as an infrared “beacon” that a robot will follow around, or as a remote control. However, it is quite limited in that, by default, it can only control two motors. However, it can be switched to any of 3 channels, which can control different motor outputs. By sticking together two remotes (using Technics pins), and setting them to different channels, you now have the ability to control 4 motors in two directions (or a total of 10 individual buttons). This will work perfectly with the built-in IR control features in the brain, so you can remotely operate quite complex robots without having to do any programming. Very useful for testing and debugging. There are two versions of the Mindstorms EV3 kit: a Home version and an Education version. The MAJOR difference between the two kits is that the “home” version includes the IR sensor and the IR remote control. This is extremely useful for controlling a robot without a phone or tablet. The Education version does include a Gyro sensor and an Ultrasonic sensor instead – the Gyro is useful for building balancing robots. Education also includes a rechargeable battery. For maximum flexibility, start with the Home kit and add elements from the Education set as needed. You can easily add support for the Edu sensors to the Home software by following these instructions. Here is a useful chart of the differences between the two kits. The EV3 Laboratory book mentioned above also includes this chart, complete with Bricklink part numbers. The bare minimum: if starting from the Home kit, add the Gyro sensor and the rechargeable battery. If starting from the Education set, add the IR Sensor and 2 IR beacons/remotes (see point 4 above). The batteries for the whole Lego Mindstorms EV3 system are stored in the brain brick, under a cover. The challenge is that in a lot of robots, the battery compartment is often inaccessible. The batteries don’t last that long, so you’ll find yourself taking apart the robot to change batteries. (Even some otherwise well thought out projects from books have this problem.) The rechargeable battery that comes with the Education set (and is available separately) helps a lot. Just make sure to leave a space for the charge cable, and you should be able recharge the robot batteries without disassembly. As you make stuff, you’ll discover that there are some modules that you end up using over and over. For example, I like the Simplest EV3 Claw from Instructables, and the ball shooter assembly from the standard Lego models. Rather than taking them apart, I just get the parts from Bricklink for these modules so that I can keep them handy as I build new things. A robot with a couple of extra modules: a vertical grabber and a ball shooter. These just plug in! The world of Lego is a complex universe, but almost all of the parts can work together. For example, Bionicles/Hero Factory parts are compatible with Lego Technics and Mindstorms, adding a number of useful ball joints and decorative parts. 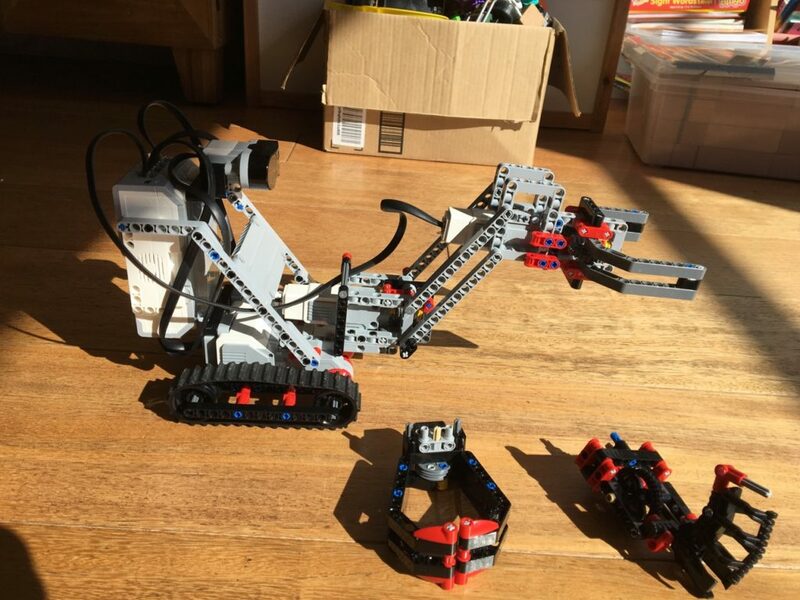 You can use the various Technic bricks to incorporate regular Legos into Mindstorms robots. (In fact regular Legos and Duplo interlock nicely – did you know that?) As you build projects, consider the possibilities to add parts from other Lego systems. (Note that some of these are disallowed in competition). 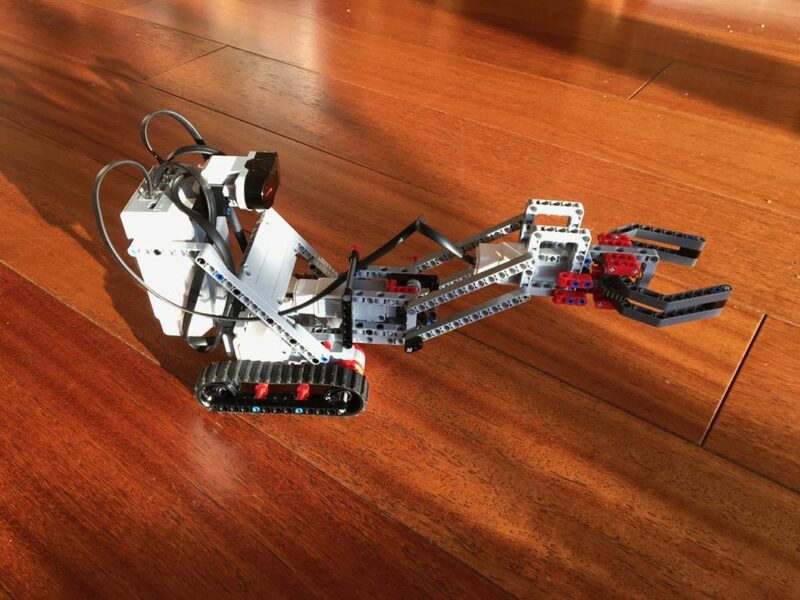 Going forward, you may want to take advantage of the flexibility of the Mindstorms construction system, but add more advanced features like video streaming, computer vision, Internet control, etc. For these, a good option is to use alternative brains based on systems like the Raspberry Pi. This is a full Linux based computer that costs only $35. You do need an adapter board to connect to Mindstorms sensors and motors. Two good options are PiStorms from Mindsensors and BrickPi from Dexter Industries. Check out the offerings on their site for additional sensors and upgrades. This is a terrific way to expand into advanced robotics while using a familiar building system. 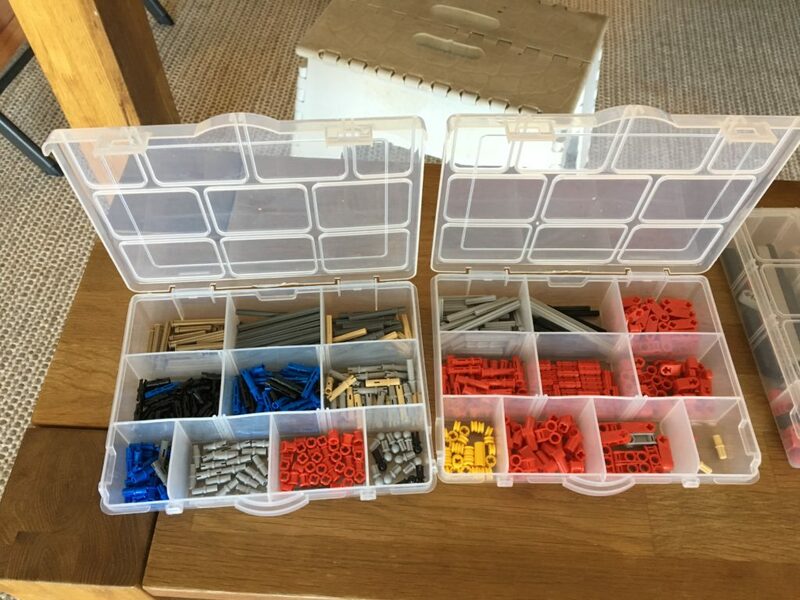 As with regular Legos, it is really important to keep things organized! There are lots of little parts that are essential, so some form of compartmented storage is essential! The Education set comes with storage, but if you don’t have that, get some kind of organizer. Everything else is key, but you’ll realize their importance later. I hope this list is useful: these are certainly all things I’d known about when I got started! I really like the robot that you built. Was that your own creation or did you follow instructions that you found somewhere? It’s a combination of the drive train of the SNATCH3R from the Lego Mindstorms EV3 Discovery book, the simple gripper from Instructables, and arm of my own design. Most of the books assume you only have the 2 large and 1 medium motor, but I have 2 medium motors, so I built a different arm.